Attend this Leading SAFe workshop to become a Certified SAFe® 4.6 Agilist. In the workshop you will learn what are the key aspects of the Scaled Agile Framework that make it such a good fit for the mainstream enterprise struggling to scale agile beyond the team level. Explain the principles behind SAFe® – Lean, Agile, and Product Development Flow. Explain and evangelize the use of SAFe® in appropriate contexts. 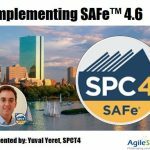 Explain the key aspects of the latest SAFe® version- Agile Release Trains, Program Increments (PIs), Release Train Engineers (RTEs), Agile Architecture, Epics/Features/Stories, ScrumXP Teams, Scaling Leadership, and more. Participants of this course will be eligible to apply for 14 PDU’s toward their continuing education requirements with the PMI (Project Management Institute). How do I get certified as a SAFe 4.6 Agilist? You can contact us at info@agilesparks.com with any question you have about the content or logistics. Up until 7 days before the event you can cancel at no charge. Afterwards you can either get a 50% refund or the option to apply your ticket towards a future workshop. The course will open only if a sufficient number of participants is reached. AgileSparks reserves the right to cancel the course up to 5 business days before it starts.